for The Runaway Slave at Pilgrim's Point. I recommend listening to these with the essay at http://www.florin.ms/ebbflor1.html, etc., with texts and images. 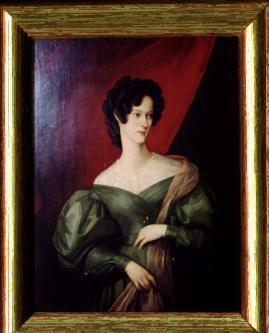 I plan next to record her sprightly Lady Geraldine's Courtship, in which she had proposed to Robert, and the nine-book epic/novel, Aurora Leigh. 'That the Swiss-owned, so-called 'English' Cemetery in Florence be kept open, be restored and be declared a UNESCO World Heritage Site', and with 3471 signatures in-house from our visitors, for a total of 4837 signatures. We have decided to keep them coming. Seven years ago I became Custodian of the Porta a' Pinti Cemetery, the Swiss-owned so-called 'English' Cemetery, in Florence. The Swiss had bought the land for it outside the Porta a' Pinti Gate from the Grand Duke of Tuscany in 1827. You can find it in Google Earth at Piazzale Donatello, Florence, Italy. It had been subject to neglect for more than a century following its 1877 closure caused by Giuseppe Poggi's destruction of the medieval city wall. When I first came on the job I was asked to catalogue the tombs. All I then had was an alphabetical Register of burials drawn up in 1877. There was no map to the tombs. So I located them and transcribed their inscriptions. Of the more than 1,400 burials between 1827-1877 there are now less than a thousand extant tombs. After a year I was joined by an Italian woman scholar, and together we translate into our mother tongues this material, including those of the Proceedings of a City and Book international conference we organized with the Gabinetto Vieusseux on the Cemetery in 2004, publishing these on the Web at http://www.florin.ms/gimel.html. Because these are in Italian, English-speaking scholars searching the whereabouts of Hugh James Rose, the clergyman who initiated the Oxford Movement, could not find him. I did. 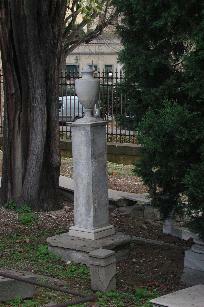 He is listed as 'Ugo Giacomo Rose' and he is buried in a fine marble 'Scipio' tomb. So I took to giving the correct national form of the name in RED CAPITALS at the beginning of each entry, followed immediately by the nation of provenance in BLUE CAPITALS, and augmented the information in the Register. Russian scholars assisted us with our Russian burials, consulting records in St Petersburg and at the Orthodox Church in Florence. An English scholar consulted the London Guildhall Library and Foreign Office records of English persons buried here. While the Swiss originally listed Poles as Russians, I separate them. I do the same with the English, giving whether they are Scots, Irish, Welsh, or Australian. The independent Swiss and Americans did not have a church that did double duty as a Civil Service organ of their governments so we lack double record keeping for their burials. V=damaged by vandalism to be repaired; ^=needing to be photographed; * =register and tomb checked against each other; ° =living descendants, relatives, researchers; § =further documentation in cemetery archives;/ BOLD CAPS, IN RED=FIRST NAME, (MAIDEN NAME), SURNAME/ IN BLUE=COUNTRY/COUNTRIES/;/normal type=1877 alphabetical register entry ending with tomb number, written in Italian/ 1844-1871/; additional information from 'Eglise Evangelique-Reformé de Florence Régistre des Morts', 2 vols, written in French/; / /=additional information, including codes GL=London Guildhall Library, PRO=Public Record Office, FO=Foreign Office, kindly supplied by Anthony Webb researching the English in Tuscany; Maquay Diaries=John Leland Maquay, Jr, Diaries, information kindly supplied by Alyson Price, Archivist, Harold Acton Library, Florence; Talalay=Michail Talalay, 'Tombe dei Russi nel Cimitero detto "degli Inglesi"', con l'assistenza di Gino Chelazzi, RC in Talalay=Registro del Cimitero, St Petersburg MKF in Talalay=Metrickesie Knigi Florencii, Libri parrochiali di Firenze, Chiesa Ortodossa; DND, NDNB, Dictionary of National Biography, New Dictionary of National Biography; Freeman=James A. Freeman, 'The Protestant Cemetery in Florence and Anglo-American Attitudes toward Italy, Marker 10 (1993), 219-243; Henderson=Philip Henderson, Lucca, has further information concerning family backgrounds/ [ ]=description of tomb]; BOLD (CAPS EXCEPT WHERE INSCRIPTION USES lowercase)=INSCRIPTION ON TOMB/; A1A, etc. coordinates indicating tomb position in cemetery/ tomb sculptor, signature of sculptor on tomb. During the next few years more registers came to light. (It had been said they had been lost in the 1966 Flood when I had inquired concerning them.) These earlier and contemporaneous registers were being written out in French, and meticulously gave the mother's maiden name, the canton of birth, and the occupation of the one being buried. So we enter all three forms of the names, in English, in Italian, in French, to aid in retrieval. We remind Anglo-Saxon users that in Italy wives are known by their maiden, not married names. Last of all, we received the Belle Arti records telling us which sculptor created which tomb. The sculptors of our tombs, two of whom, Americans, came to be buried with us, number amongst the most famous of the nineteenth century. I have written a separate essay on these sculptors at http://www.florin.ms/sculptors.html. Essential for this work is a good digital camera, a computer, and a website, as well as files for the incoming information concerning the burials of different nationalities from descendants and scholars, again a taxonomy, this time geographical, ours consisting of folders on the English, the Swiss, the Russian (Russian and Polish), the American, the Continental (French, Dutch, German, Swedish, Danish, Finnish, Latvian, Hungarian), and the Australian burials. This research is ongoing. The entire catalogue is now placed on the web in four files at http://www.florin.ms/cemetery1.html, etc. to http://www.florin.ms/cemetery4.html. Descendants from as far away as Australia and Africa then find their ancestors. Daily, I get e-mails with further information and/or queries, many having found these entries through searching with Google. Sometimes photographs taken in 1960 can arrive from Australia enabling us to replace lost inscriptions from tombs that are now vandalized. Or fine portraits are sent to us of those buried here for our archives. UNESCO's conference on information technology and museums suggested I also weblog, which I do at http://piazzaledonatello.blogspot.com. 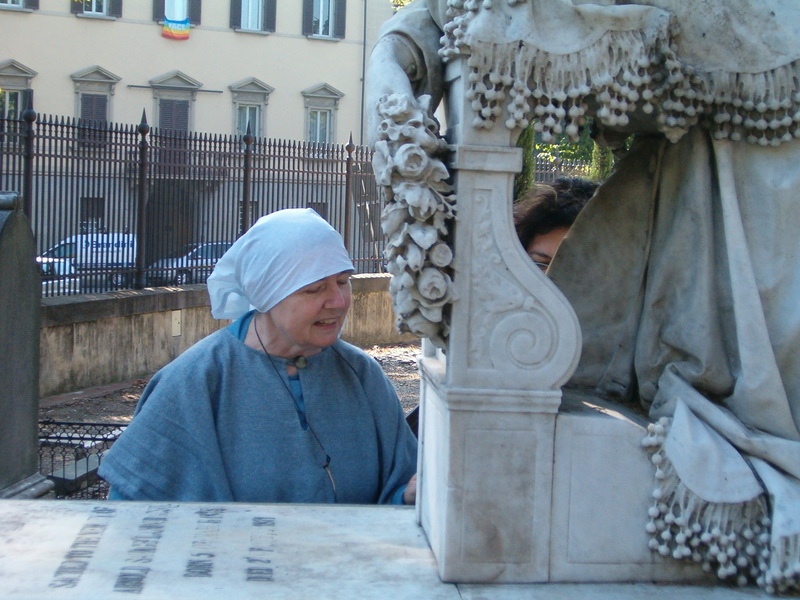 What we now have is a global and interactive oral history project using the latest information technology centred on one small but famous historic cemetery in Florence. Our taxonomies tend to use the alphabet, itself an 'IT' (Information Technology) invention from millennia ago, and geographical space, as well as enabling genealogical and biographical research in time. The Oxford Dictionary of National Biography has praised this work as most useful to them. We have the Swiss historian Jacques Augustin Galiffe and his family buried here and he with Jean Charles Léonard de Sismondi pioneered the study of archives for genealogical writing and history, to be followed in turn by Robert Davidsohn, also buried here, whose monumental Storia di Firenze, based on archival work is magnificent. Also, Mary Somerville buried her husband William here, and she, with no university education, had discovered two planets, her books on science being used as textbooks at Cambridge University, and she taught Ada Lovelace, Lord Byron's daughter, mathematics. Ada Lovelace, in turn, assisted Charles Babbage in inventing the computer, she suggesting to him the use of Jacquard loom cards with holes punched in them and the binomial theorem, of using zeros and ones. Because so many of our burials are of famous writers, in particular, women as well as men, Elizabeth Barrett Browning, Walter Savage Landor, Arthur Hugh Clough, Frances Trollope, Theodosia Trollope, Isa Blagden, Richard Hildreth, we also have a library which includes their writings and research concerning the Abolition of Slavery, a concern they deeply shared. We have as well six participants in the Battle of Waterloo and many friends of Florence Nightingale. We even have the tomb of the former Black slave who came to Florence at 14 from Nubia and was baptised in a Russian Orthodox family with the name 'Speranza, 'Hope', her story told on the marble in Cyrillic letters. We key the tombs in the catalogue of the cemetery to the books in the library's on-line catalogue and vice versa. Likewise, we have catalogued the remaining plants (the Cemetery had all been put to weedkiller), and we plan the cemetery's restoration as the beautiful garden it once was, restoring it from old photographs, Victorian travel book accounts, diaries and oral information: http://www.florin.ms/landscape.html. For a cemetery is a library, an archive, written on marble. Having already edited the poetry of Elizabeth Barrett Browning (our most famous burial) for Penguin, I now use this Cemetery and its archive as primary material to teach myself and others such ancient and modern archival skills necessary to learn how to make these dead bones, as in Ezekiel, come back to life for our visitors, and virtually on the web. The catalogue, the taxonomy, is to assist in finding them. Each tomb has a human story that can now be unlocked, told and shared with all. Let me give you one. One day two cousins came, seeking the tomb of their ancestress. She had died in childbirth, as so many women did in the nineteenth century. Likewise their babies. So I asked about the baby. 'Oh he's our ancestor, too', they explained, telling how Sarah McCalmont's Anglican clergyman husband had brought the motherless bairn and its wetnurse home to England, at one point in France pushing the carriage up a hill. Pietro Bazzanti would have been paid handsomely for this tomb with its many inscribed letters. I asked whether there was a portrait of her. And here she is, straight out of the pages of a Jane Austen novel. Next, I was able to bring a Swiss scholar, writing a biography of the surviving son, together with the two cousins in England who are his descandants. Often so we find we can join lost branches of families, including those in France with those in Australia of a half-Italian, half English family, or of a Swiss family with members in Sweden and those in Florence. In this way, too, we involve numerous persons, descendants and scholars, and associations: the Browning Society, Trollope Society, Walter Savage Landor Society, Historic Gardens Foundation, Waterloo Society, Friends of Leighton House Museum, Somerville College, Oriel College, the Oxford Dictionary of National Biography, the Museo Archeologico Nazionale di Firenze, ASCE (Association of Significant Cemeteries in Europe), Association for Gravestone Studies, etc., globally in the challenge of finding funds for the very beautiful but ruined cemetery's much-needed restoration. This is the talk I gave yesterday in Italian for ICCD (Istituto Centrale per il Catalogo e la Documentazione), the Comune di Roma, and ASCE (Association for Significant Cemeteries in Europe), in the Auditorium Ara Pacis. 'That the Swiss-owned, so-called 'English' Cemetery in Florence be kept open, be restored and be declared a UNESCO World Heritage Site', and with 3360 signatures in-house from our visitors, for a total of 4717 signatures. We have decided to keep them coming.